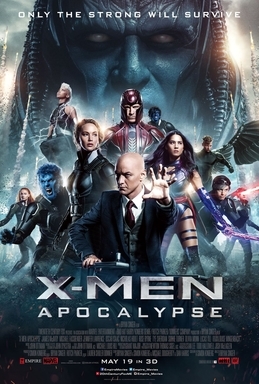 So out of the current superhero franchises I’d say the ‘X-Men’ films are probably the one’s I enjoy the most, and I’d probably rank ‘First Class’ as the best superhero film of the last 4/5 years. So it’s kind of disappointing that ‘Apocalypse’ is just alright, with an unoriginal story, a dull, one note villain and a focus on too many characters. On this occasion, we’ve jumped into the early 80s and all of the primary characters are scattered around the globe after the events of the ‘Days of Future Past’. An opening scene set in ancient Egypt introduces us to the villain of the piece, a ‘super mutant’ known as ‘Apocalypse’ who has lain dormant for thousands of years, only to be reawakened in the present timeline. As a villain, Apocalypse’s aims are to destroy and take over the world, which is standard superhero fare and nothing about the character strays too far from this outline. He’s played by Oscar Isaac, who does what he can, but it’s a waste of such a good performer to stick him under such heavy prosthetics for the entire movie and to land him with some of the clunkiest dialogue in the script. The film does have its good points, and it mainly comes from the established cast and the strong level of the performers on show. Michael Fassbender continues to be wonderfully conflicted as Magneto, playing the good/evil battle in the character well, and the remainder of the regulars are all mostly good. There are a few newcomers in this entry, with Kodi Smit-McPhee’s Nightcrawler and Sophie Turner’s Jean Grey getting the most screentime, and once you get past Turner’s slightly wonky attempt at an American accent she’s pretty good. The standout performer is once again Evan Peters who absolutely kills it as Quicksilver, getting most of the laughs and taking part in the most purely entertaining moments in the movie. There’s good camaraderie between the cast and the script is pretty funny throughout (I particularly liked the meta ‘Return of the Jedi’ remarks), although disappointingly the narrative doesn’t dovetail with real historical events to the same extent as the last couple of films did. . The issue with all of these wonderful performers and characters is that it’s difficult to give them all a satisfying arc, and ‘Apocalypse’ fails in most cases here. Apocalypse’s horsemen are largely perfunctory and having many of the primary characters in different locations makes it challenging to tie their stories together in a meaningful and satisfying way. There’s still a lot to like here, but this is comfortably the weakest of the three films with this core cast group and hopefully by the time it comes round to the next entry in the franchise Bryan Singer (or whoever directs) will come up with something more original to match the first two excellent movies.